The thermodynamic efficiency of a refrigeration system depends mainly on its operating temperatures. However, important practical issues such as the system design, size, initial and operating costs, safety, reliability, and serviceability etc. depend very much on the type of refrigerant selected for a given application. Due to several environmental issues such as ozone layer depletion and global warming and their relation to the various refrigerants used, the selection of suitable refrigerant has become one of the most important issues in recent times. Replacement of an existing refrigerant by a completely new refrigerant, for whatever reason, is an expensive proposition as it may call for several changes in the design and manufacturing of refrigeration systems. Hence it is very important to understand the issues related to the selection and use of refrigerants. In principle, any fluid can be used as a refrigerant. Air used in an air cycle refrigeration system can also be considered as a refrigerant. However, in this lecture the attention is mainly focused on those fluids that can be used as refrigerants in vapour compression refrigeration systems only. 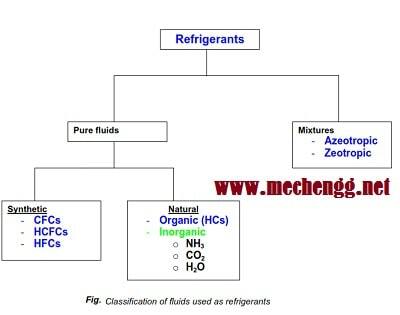 Fluids suitable for refrigeration purposes can be classified into primary and secondary refrigerants. Primary refrigerants are those fluids, which are used directly as working fluids, for example in vapour compression and vapour absorption refrigeration systems. When used in compression or absorption systems, these fluids provide refrigeration by undergoing a phase change process in the evaporator. As the name implies, secondary refrigerants are those liquids, which are used for transporting thermal energy from one location to other. Secondary refrigerants are also known under the name brines or antifreezes. Of course, if the operating temperatures are above 0 Deg C, then pure water can also be used as secondary refrigerant, for example in large air conditioning systems. Antifreezes or brines are used when refrigeration is required at sub-zero temperatures. Unlike primary refrigerants, the secondary refrigerants do not undergo phase change as they transport energy from one location to other. refrigerants are the solutions of water and ethylene glycol, propylene glycol or calcium chloride. These solutions are known under the general name of brines. 2. Mixtures: Azeotropic mixtures are designated by 500 series, where as zeotropic refrigerants (e.g. non-azeotropic mixtures) are designated by 400 series.